The first three issues of the rare In Ruhleben Camp magazines from 1915, digitised as high resolution JPEG files. As an extra, this CD also includes the Ruhleben Bye-Election special of July 1915, as well as a complete listing of all the prisoners found so far in the project, with biographical notes where known. 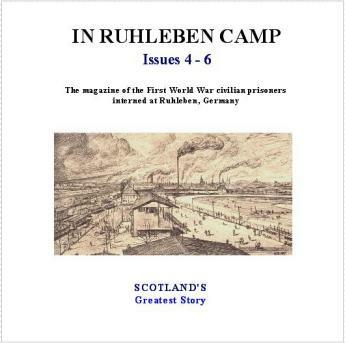 Issues four to six of the rare In Ruhleben Camp magazines, digitised as high resolution JPEG files. As an extra, this CD also lists the inmates in Barrack 5, as noted from a surviving register, as well as a complete listing of all the prisoners found so far in the project, with biographical notes where known. Issues seven to nine of In Ruhleben Camp from 1915, digitised as high resolution JPEG files. As an extra, this CD also contains the In Ruhleben Camp Christmas edition (1915), as well as a complete listing of all the prisoners found so far in the project, with biographical notes where known. 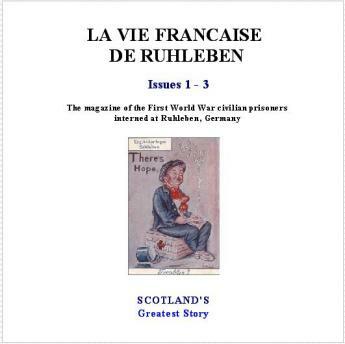 Issues one to three of La Vie Francaise de Ruhleben, digitised as high resolution JPEG files, as well as a complete listing of all the prisoners found so far in the project, with biographical notes where known. Please contact me at christopherpaton@tiscali.co.uk should you wish to purchase any of these items. Postage is £2 per item, though I am happy to combine postage on multiple purchases.